As many of you know, I’ve been chronically ill since 2008, not long after I turned 18. For six of those years, I went undiagnosed and I was mostly bedridden, in excruciating pain with a 24/7 migraine, extreme fatigue, severe insomnia, shaking, anxiety, hallucinations, and so much more. The medicines they were putting me on were making me suicidal, and my hopeless situation, with no knowing what was wrong or if it would ever end, wasn’t helping my depression. My insomnia and anxiety were so bad that I was having panic attacks just getting out of bed to make tea, and my chronic migraine was so severe that just walking out of my darkened room hurt my eyes and trying to hold a conversation with my parents, who thankfully were taking care of me, made my ears and head pound to the point of crying. Keep in mind, this and much more was happening daily for six years. You may also know I began drawing two years into this illness, a talent I never knew I had, and the silver lining to the years of hell. It was a talent that erupted out of the darkness like a volcano, and I’ve been drawing ever since, focusing that newfound talent on animals, which have always been a passion of mine. 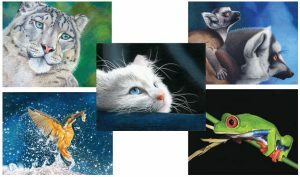 Some of my colored pencil drawings of animals. What you might not know, however, is that in 2014, when I was finally diagnosed with chronic Lyme disease, Bartonella, Hashimoto’s Thyroiditis, malfunctioning adrenal glands, and more… it was the first time in over six years that I’d felt hope. That it was the first time I allowed myself to think of a future again, which had been off limits to me since falling chronically ill. If you think your future is going to be the same excruciating misery you’re in now, you tend not to think about it. Being undiagnosed and having medicines make me worse instead of better, I thought I might be doomed to a life barely surviving. 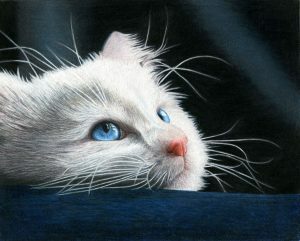 What you also might not know is that when I started my long-term treatment in 2014 and started to see some improvement in my health for the first time, this drawing of the Blue-Eyed Kitten was the first piece I created. 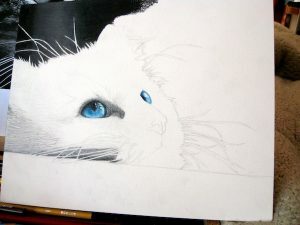 Work in progress of my Blue-Eyed Kitten drawing. You can see in the background the blanket that was on my lap. Yes, I really did draw from bed in those days! 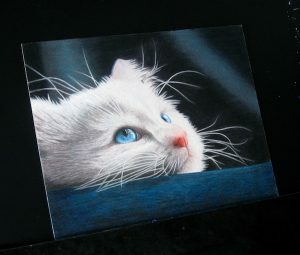 Cats are my favorite animals, and without really knowing it, I put all of my hope and emotion into this piece. You’ll notice the kitten isn’t bounding about, she isn’t playing or having fun. She’s still tired and forced to rest, but that LOOK. Those bright eyes full of hope, daydreaming for the first time in years…that was me. In a weird way, this is probably the most accurate self-portrait I’ve ever created. Perhaps not surprisingly, this drawing has become one of my all time favorites that I’ve done to date. Because of all the sentimental value, I’ve chosen to keep the original drawing to myself for now, although she occasionally goes on display with my other drawings during exhibits. However, prints and products of this drawing are always available! Check out some of the cool options below, where you can get to experience this piece for yourself and have that daily reminder of your own hope, your own future, and your own aspirations. 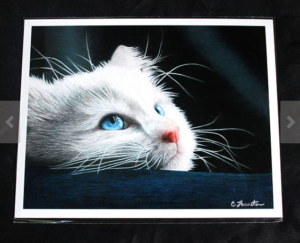 Photographic prints of the Blue-Eyed Kitten drawing, starting at only $20. Purchase one here. 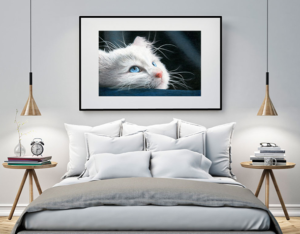 Archival prints of the Blue-Eyed Kitten, metal prints, and canvas prints can be purchased here. 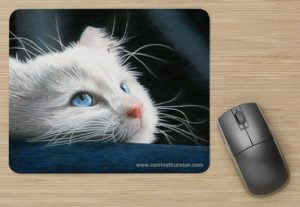 Mousepads of the Blue-Eyed Kitten are available here, to look back at you on your desk every day and make your work day a little better. 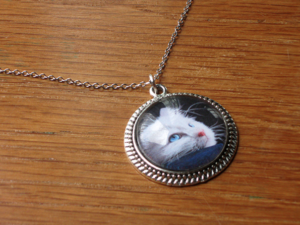 Necklaces of the Blue-Eyed Kitten are always available here. What do you think of this piece? Can you feel the emotion behind it now that you know the story? Upcoming Art Reception and Double Book Launch Party – Details! You Could Win A Free Book – Time Sensitive! I am just amazed at the expression you delivered in your “self-portrait”! All your paintings are wonderful! I am very sorry about your illness and hope that you will find relief. I loved this before I read your story. I love it more now. I call it Healing Art. I started drawing when grounded by Multiple Sclerosis. I worked as a nurse for many years. Coincidentally I started following a Lyme specialist on twitter. Beautiful, thoughtful, emotional story. Out of pain and misery can come transformation. Thank you for sharing, Corrina. Keep up to date on print releases, events, courses and other news from CAT Studios.